At VDI Plastics in Automotive Engineering 2015 conference, BASF unveiled a novel engine covering made from flexible polyurethane integral form with a one-shot process. 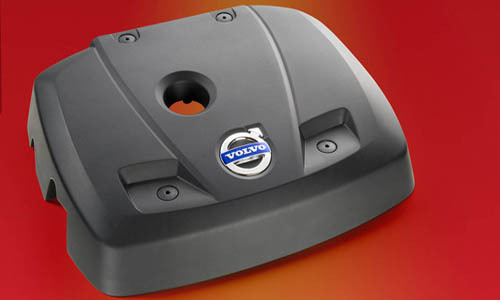 The “soft” cover, made from BASF’s Elastofoam I 4603, is manufactured by the Austrian company Polytec Car Styling and fitted as standard in various car models with petrol engines of the Swedish automobile manufacturer Volvo. The sound-absorbing material for the flexible visible part has a low component density of 140kg/m³, is dimensionally stable, media-resistant as well as resistant to thermal aging up to 150°C. While the part has an open-cell foam structure on the bottom surface, the material on the front side forms a coherent skin with a printable surface appearance. Not only offering good sound absorption and thermal engine encapsulation, it can absorb a lot of energy on account of the open-cell foam structure, thus increasing passive safety for pedestrians in the event of impact against the hood. Volvo currently uses the engine cover, which weighs from approximately 1.3-1.7kg depending on the automobile model, in four different versions. In comparison to conventional engine covers made of two materials, the elastic soft cover foamed in the cost effective one-shot process is able to integrate acoustic and mechanical properties in one part, BASF emphasized.